Now turn the clock back to 1913. Two Mormon missionaries were tracting a modest neighborhood on the outskirts of Aurora. They were a little discouraged because, as far as they knew, they were the only Latter-day Saints in the city, and even if they were to find a family to teach, they couldn’t invite them to church—there was no branch in Aurora. Then, to their surprise, a young mother with two small children invited them in. “I’m a member,” she told them as she hurried into the kitchen to bring back a jar of coins and small bills. “It’s my tithing,” she said and placed the jar in their hands. Delighted to find a member of the Church, the elders began to get acquainted. All too quickly, they realized her error—she belonged to the Reorganized Church, not the “Salt Lake Mormons.” Undaunted, they told her she would need to be baptized again, and eventually she agreed. 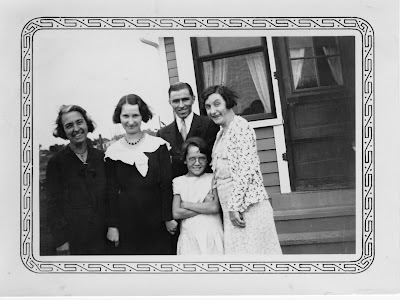 Mable Clair Kiesel [Stemple] was baptized in the Fox River on June 13, 1915, the first member of the Church of Jesus Christ of Latter-day Saints in Aurora. But the Church did not go continue in Aurora at that time. Fourteen years later, Mable Kiesel Stemple was found again, this time by Jim and Myrtle Greer. But that’s another story. 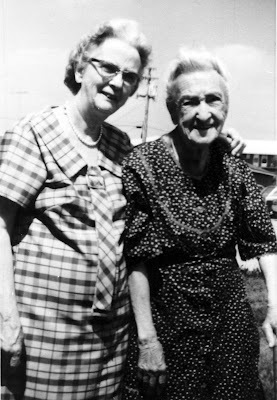 This picture of Sister Stemple (right) with her niece, Gladys Lancaster, is the way I remember her. Very tiny, white hair in a knot on top of her head, and a big smile. Maybe Sister Stemple’s family can fill in some more details. Good story..Again great pictures. So funny about the RLDS membership. She sounds like she was a great person.